A month ago, Anaheim defenseman Kevin Bieksa took down Philly’s Radko Gudas almost instantly with his right hand when Gudas dared to challenge him. 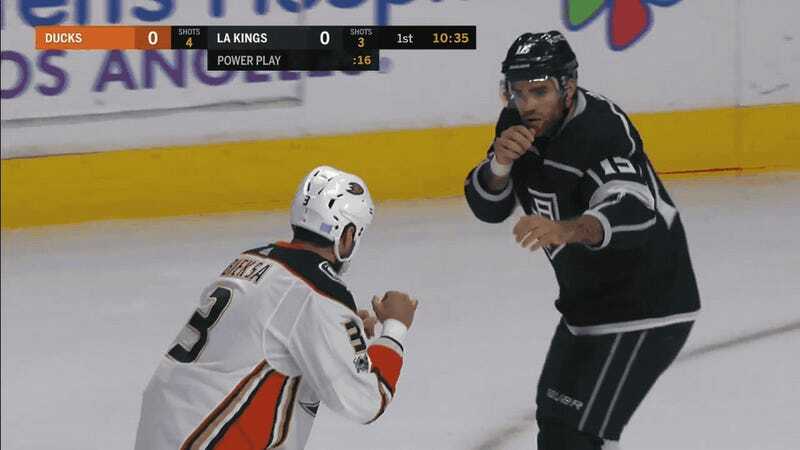 Apparently, the Kings’ Andy Andreoff either didn’t watch that game or thought he was much tougher than Gudas, because last night, he, too, willingly got into a scrap with Bieksa, following two other first-period fights. Again, it did not go well for Bieksa’s opponent, who became quickly acquainted with the 36-year-old’s right fist. This move from Bieksa looks even worse for Andreoff than it did for Gudas, because at least the Flyer got a handful of Bieksa’s jersey to drag the Duck down with him. Andreoff just crumples, and he wouldn’t return to the game. The Kings got the metaphorical knockout punch, however, winning 2-1 in a shootout.